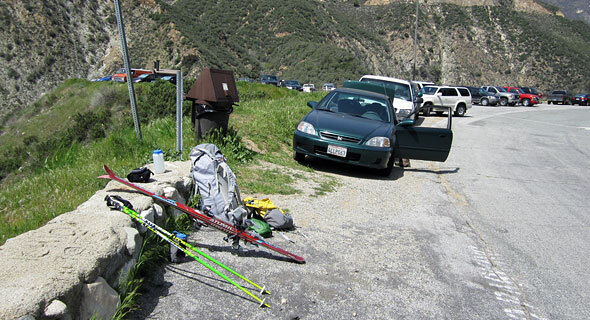 I am sitting beneath a shady tree at the Heaton Flat parking lot, elevation 2000', staring at my skis and heavy pack, waiting for Dave and his friend Lou Bartlett to arrive. With a San Antonio Ridge ski traverse having proven unfeasible, this is the last desperate option to ski Iron Mountain: the Heaton Flat Approach, starting low and deep within the East Fork of the San Gabriel River drainage. The day is hot and Dave is running late. I'm not really sure at this point whether or not I actually want Dave to show. Strapping skis to my back and hiking anywhere from here seems like a really, really bad idea. Truth be told, I'd be perfectly happy to toss my skis, pack, and gear back into my trunk right now and get the hell out of here. But no—there's Dave driving up now. Looks like this is really going to happen. I feel fairly confident in guessing no one has ever carried skis all the way up the south ridge from Heaton Flat. Maybe in some stupendous snow year long ago, someone else might have tried it. But even that seems unlikely. We greet each other, and I'm introduced to Lou, who is one of Dave's long-time climbing and skiing partners—no doubt tough as nails. Dave and I engage in a short but spirited discussion regarding whether or not we should carry skins. I don't think there's any possibility we'll end up using them, and I'm loathe to carry any unnecessary weight. Dave feels otherwise. Lou casts the deciding vote: we take the skins. I still don't think there's any chance we'll use them, but I acquiesce. It's time: on go those heavy packs, skins included. We leave the paved Heaton Flat parking lot and put our boots to the trail. The awful preflight dread is over now, at least. Now there is only Iron Mountain's massive 7200' vertical to be gained—though I'm trying desperately to ignore that number. Of course we draw stares from the other hikers out and about on this sunny Saturday afternoon. As we pass we get a steady flow of questions, most of them centered around just what the heck we think we're doing today. We're making a documentary about crazy people, I think to myself. And I'm the lead. But the casual hikers and their questions soon diminish as we get farther from the trailhead. Our pace is probably a bit too fast given the heat. Soon, we're all slicked with sweat, and I begin wondering if the three liters of water I'm carrying is going to be enough to get me to the snow—wherever that is. I find Iron Mountain's vast vertical distances wholly deceptive. Heaton Flat Trail climbs steeply right from the start, and we've soon gained a solid thousand vertical feet. It's possible, looking at Iron's south ridge ahead, to think we're nearing the summit, but in reality we're still just scratching around the lowlands here. There is so much more work ahead.